Where has the time gone? I just looked at the time stamp from my last entry and six whole days have passed since I have done any stitching. The heat and humidity are partly to blame as is my new resolve to read more books while decreasing my mindless internet time. Work is a bit nutty at the moment as other staff members are off on vacation. Plus, there was a promotion party for one of the fella's colleagues, our Maggie requires daily walks and attention, one cat is coughing up hairballs, etc. We spent the afternoon today at a friend's son's birthday party, enjoying the beautiful summer day while hanging out with friends in the pool. All of the sunshine and shenanigans left us rather tired so my evening was spent relaxing on the couch with needle and thread in hand. 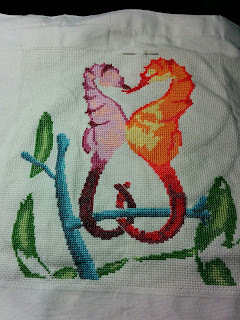 The seahorses are coming along nicely. Only the fin of the orange seahorse and the parts of the leaves that require DMC 319 remain for the full crosses before I start the back stitching. I have no definite plans for what I will stitch after this bag is completed, but I have been looking at cat themed patterns on pinterest and I have been thinking about making myself a pin cushion. My idle needles are all shoved onto a scrap piece of Aida which has been holding my needles nicely for years. Seeing all of the beautiful smalls projects on the various cross stitch groups that I belong to on Facebook has given me pin cushion and biscornu envy. Time will tell where the next project will take me although these are my preliminary thoughts.